Michael Lund is one of our workshop leaders in the Veteran’s PTSD Project (VPP) Facebook writing workshop. Lund is a retired professor of English and lives and writes in Virginia. An Army correspondent in Vietnam, 1970-71, he is the author of a collection of short stories, How to Not Tell a War Story, and a novel series inspired by The Mother Road, including Growing up on Route 66 and Route 66 to Vietnam: A Draftee’s Story. On a small table in my living room sits the Underwood standard typewriter I purchased as a high school senior in 1963 from a fleet of used machines being sold at an auction. Mechanical, black, ridiculously heavy, it’s a tool I found you must engage tactilely, pounding the individual keys with fingers, hitting the space bar with thumbs, sending the carriage flying back with a flip of the wrist at the sound of a bell. This Underwood is a key to my stability. I carried–perhaps lugged is a better word–this monster to college with me and on to graduate school. It traveled with me in my brief Army career. though not, obviously, to Vietnam, though there was a mate there for me to use as an Army correspondent. At my first teaching position, I typed tests, scholarly articles, and drafts of stories I would later write about my military experience. Each finished piece was a material object. The key I pounded levered an inverted piece type up and smacked it onto a ribbon soaked with ink, leaving the shape of a letter on paper flattened against a patten. With my hands I struck the keys in the necessary order to produce words, arranged those words into sentences, shaped the sentences into paragraphs. They all represented ideas, but ideas literally hammered into place by me with the Underwood standard. When the personal computer became available sometime in the early 1980s, of course, I switched to the new technology. 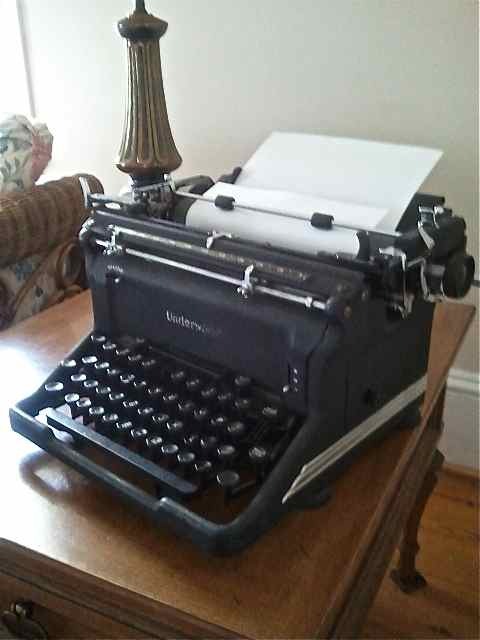 I still had a tendency to bang the keyboard and to reach up to return the carriage; but the speed of editing, the easy of producing (and saving) multiple drafts, the reduced cost of paper (one clean copy at the end) were obvious even to traditionalists. The Underwood was put away in a closet, forgotten for some years. The machine that had proven necessary to my academic and professional career returned as an objet d’art, something for children and even young adults to inspect next to old pocket watches, a few first editions of hardbound books, memorabilia form my parents’ and my own lives. A key to the past, it sits appropriately in a house built in 1905. When I see my Underwood, I am reminded that writing is a labor to overcome disorder, an effort to gather into one structure disparate, sometimes warring elements of our world and selves. To impose structure on my thoughts, feelings, and desires I have put them into words and those words into familiar shapes–letter, essay, memoir, short story, novel. When I hosted a writing seminar for veterans in my rural community last summer, I hoped I would be able to encourage the six participants–all about my age–to achieve the same settling of things that matter into a comforting shape. I offered advice from my more than 35 years of teaching about shaping an argument, narrating an experience, describing a character. I explained, however, that the process would at times be challenging, roadblocks might occur, it was possible to veer off course. They, too, would have to hammer words into patterns, even if their fingers were just tapping a touchpad. Still, whatever the effort, their sense of personal and communal history would be strengthened, I predicted, their approach to the future made more clear, the sense of who they are and what they’ve done become more sure. Though all achieved these ends, I will refer to only one individual: a military wife whose son lost a leg in Iraq. That admirable young man had recovered to the point of skiing, completing college, running marathons, helping other veterans, marrying, starting a family. So the story was not about him, but about his mother, who flew from Virginia to Germany to be with him immediately after he was wounded, who lived at Walter Reed as he went through rehab, who wrestled procedure, paperwork, and regulation for him long after he was released. She knew she had a story to tell: the trauma of a mother who almost lost her son. That story is not done. She finished one fine chapter, drew up drafts of several more, and continues to work as her busy schedule allows. Her family has entered into the process, reading drafts of different sections, offering memories, encouraging her to get it all in, to get it all right. She laughs when she tells me the project may expand to a series of books, not just one, with many collaborators. She has been pleased at each stage of the process, satisfied at the growth she has found in herself and in others through the process of writing. If my Underwood standard no longer has a function in producing documents, it serves as a key reminder to me of the solidity, the weight, and the staying power of experience put into words. Writing benefits the writer (in my friend’s case, the writers) and readers. I encourage those who have carried the burden of service to produce products of their experience in words, coming to terms with and growing from traumatic events they have had to endure for their country.